General Dynamics Ordnance and Tactical Systems – Canada (GD-OTS – Canada) demolition charges and explosives are widely used by commercial and military customers alike for implosions, cratering or EOD applications. The M2A4 and M3A1 charges are mostly used for blasting earth craters and to bore holes in metal, masonry or reinforced concrete. The C-126 charge is designed for cutting structural steel or reinforced concrete encountered on bridges. The M2A4 Demolition Charge is a high explosive (filled with Comp B) shaped charge used in a variety of demolition tasks. The charges are used for blasting earth craters and to bore holes in metal, masonry or reinforced concrete. The M2A4 Charge is supplied with a stand-off support that fits on the bottom end of the charge to provide stand-off distance for shape charge effectiveness. It will perforate 90 cm of reinforced concrete and 30 cm of armour plate. 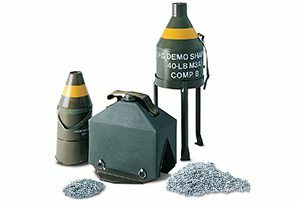 The M3A1 Demolition Charge is a high explosive (filled with Comp B) shaped charge used in a variety of demolition tasks. The charges are used for blasting earth craters and to bore holes in metal, masonry and reinforced concrete. The M3A1 Charge is supplied with a steel pedestal to provide the stand-off distance for shape charge effectiveness. The charge (13.2 kg of Comp B) will perforate 152 cm of reinforced concrete and 51 cm of armour plate. 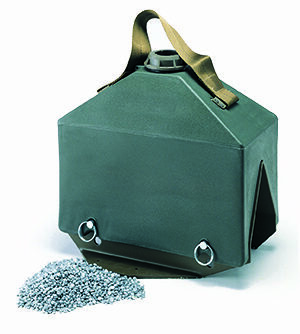 The C126 Demolition Charge is a plastic container filled with 10.0kg of Trigran prilled explosive. When the container is filled with water and an external metal liner, it becomes a powerful device for structural demolition. The charge is designed for cutting structural steel or reinforced concrete encountered on bridges. The container has the dual function of storage and transportation of Trigran blasting prills as well as acting as a demolition charge. A typical cut of structural steel is 130 mm deep at centre by 600 mm long. Trigran Prill explosive are made of 80% TNT / 20 Aluminum. The cratering performance of Trigran Prill is 50% more effective than TNT Prills and 80% more than AN/FO. Image showing demolition bridge (left) and demolition metal (right).